The Muffaletta is both a sandwich and the bread used to make the traditional, overstuffed famous New Orleans favorite. Immigrants from Sicily brought the bread to New Orleans where it grew into an amazing sandwich loaded with ham, salami, cheese and mortadella. I’ve only had a few true muffalettas in my life, none of which were eaten in New Orleans. If you ever get the chance to indulge – please do so. The signature olive salad is what really appeals to me! Nowadays, given that we are more inclined to enjoy a meatless-meal rather than a cured meat layered extravaganza, I opted to make the homemade muffaletta loaves & vegetable sandwich (in a smaller version) stuffed with a grilled vegetable base. Getting older doesn’t have to be without delicious foods! Muffaletta loaves are most often baked in a 14-inch round, stuffed and cut into individual sandwiches. Since we’re on our own these days, I thought smaller loaves would be a better choice. The bread is made over a 2-3 day period, but is incredibly easy to make, and delicious. 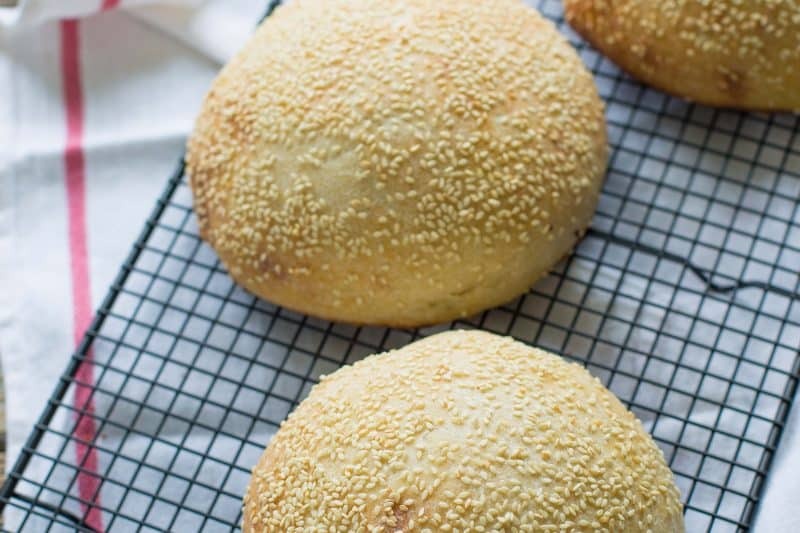 I am a big fan of sesame seeds so this loaf was a delicious way to enjoy my vegetables! Grill eggplant, red peppers and zucchini until lightly charred. 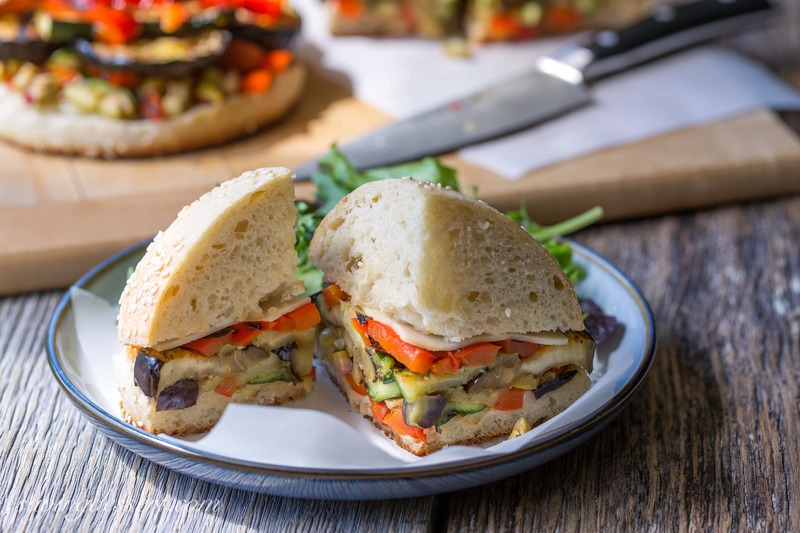 When ready to assemble cut a loaf in half and layer with provolone cheese, the olive salad, and the grilled vegetables. It may not taste exactly like the meat laden version, but this sandwich was really good and much healthier! A New Orleans inspired vegetarian version of the famous meat-packed Muffaletta sandwich. Tasty healthy version with the same wonderful olive salad. To make the starter place the 1/2 cup of water, 1 cup flour and 1/8 teaspoon yeast in a small mixing bowl. Stir to combine. Cover with plastic wrap and let it rest at room temperature overnight for if making the starter in the morning, allow it to rest for about 10 hours before making the dough (which also rests overnight). Combine the dough ingredients in a large mixing bowl of a stand mixer. Using a spatula, combine the ingredients until they just come together. Attach the dough hook to the mixer and mix until the dough is somewhat smooth but slightly rough. Cover the dough with a lightly greased piece of plastic wrap and allow it to rise in a warm spot for about 3 hours. After 1 hour gently deflate the dough and turn it over. Cover again and continuing to let is rise for 2 more house. Line a large baking sheet parchment paper and set aside. Remove the dough from the bowl and place on a lightly floured work surface. Form the dough into one 14-inch round or cut it into 3 or 4 equal pieces. 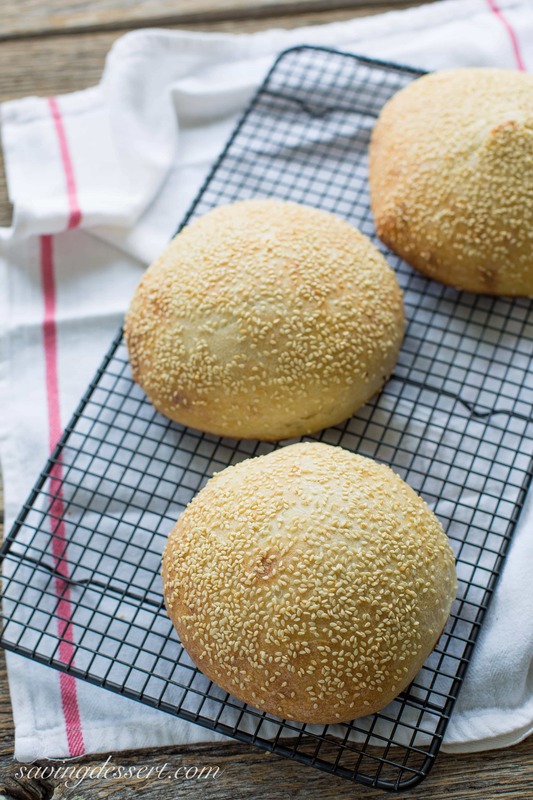 Form each into 6-inch rounds and place them on the parchment line baking sheet. Lightly spray a piece of plastic wrap with cooking spray and completely cover the loaf/loaves. Place the pan in the refrigerator and allow them to rest overnight. We ready to bake, remove the loaves from the refrigerator and let them come to room temperature about about 30 minutes. Mix 1/2 cup of water with the egg white and brush it on the loaves. Sprinkle generously with sesame seeds and gently press to adhere. Bake for 25-30 minute or until golden brown. Remove to a wire rack and cool. * The preparation time does not include resting and rising times. I made the starter on Saturday morning and 8 hours later made the dough. After the 3 hour rise I formed the loaves and placed in the refrigerator overnight. I baked the loaves on Sunday around noon. All the things you love about a Muffaletta without the processed meats! Toss the eggplant, zucchini and red pepper with the olive oil, salt and pepper. Grill the vegetables until each is charred on both sides. Remove from the heat. Slice the red pepper into thin strips and the zucchini slices in half. Slice the muffaletta (or ciabatta) loaves in half and layer with the provolone slices, one on the top, one on the bottom. Mix together the olives, peppers and vinegar. Set aside the egg plant, 6 pieces of the zucchini and about half the red pepper slices. Chop the remaining vegetables and add them to the olive mixture. Divide the olive and vegetable mixture among the cheese covered rolls. Divide the whole sliced eggplant, zucchini and red peppers on top of the olive mixture. Top with the second slice of cheese and the top of the roll. Cut in half or fourths and serve immediately. Are you ready for the July 4th holiday? Do you have big plans? My daughter is having a party at her house and I’m bringing a pasta salad and a watermelon. I bet my grandson is going to love the watermelon! I think we’ll try and pick more berries tomorrow morning so you can bet there is a cobbler in our future. Hope you have a terrific weekend. Thanks so much for stopping by! 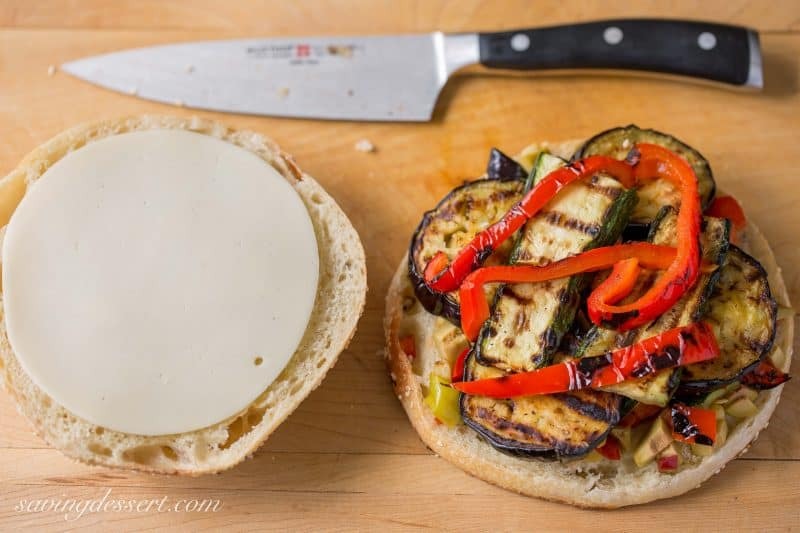 LOVE THE MUFFALETTA RECIPE AND GRILLED VEGGIES SANDWICH….WILL TRY SOON!! I had my first taste of a muffaletta in New Orleans years ago. Though it was undeniably a special sandwich, I am not overly enthusiastic about olives or processed meats. This vegetarian version, however, is calling my name! 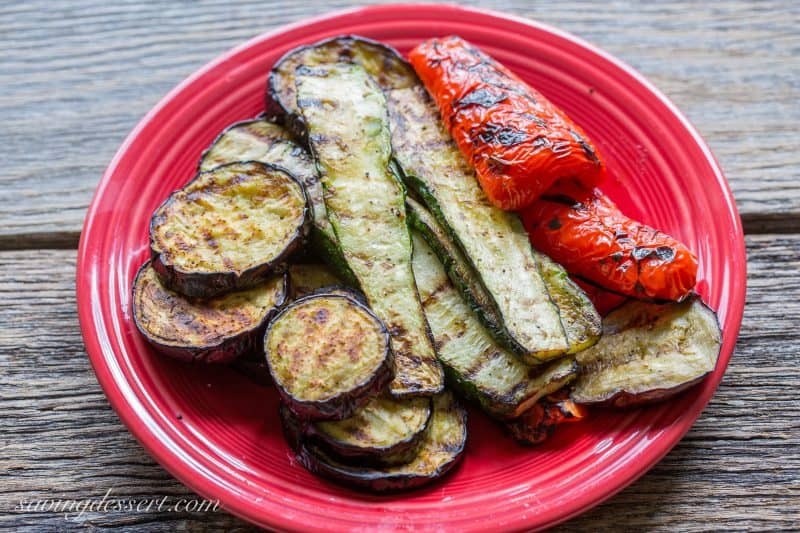 Grilling creates such great flavor in veggies. I am completely awed that you made your own muffaletta rolls! Tricia- we love this! A healthy veggies sandwich? … Perfect for the summer! And the bread looks good too! Hope you had a wonderful 4th of July! We did have a nice 4th of July – no big deal 🙂 Thanks for stopping by Anna! I adore roasted veggie sandwiches..the first muffeletta I made was so many years ago..I wonder why I have not made them recently..thank you for the inspiration! I think I’d love this version. Your grilled vegetables look wonderful. The only muffaletta sandwich I’ve ever eaten was in New Orleans, and it was terrific! How cool Beth – I would probably hurt myself if I went to New Orleans – so many wonderful foods, so little time! Hope you had a terrific 4th! I love making bread! The longer the wait, the better the bread is sure to be. Such an awesome sandwich and what a delicious way to eat your veggies, Tricia. Have a great 4th with your family! Thanks Susan – hope you had a great 4th too! I’ve always loved Italian sandwiches (and everything else) and after eating a muffaletta at Central Grocery in NOLA I was hooked on them, but haven’t had one in a while and we’ve never made one at home with actual muffaletta bread. I had a source for mortadella so I think I’ll whip up a batch of olive salad and see if the baker will make some of your rolls for us to have one (or some). So many great things going on here! I mean, you made your own muffaletta loaves! Wow – virtual high-five right there. 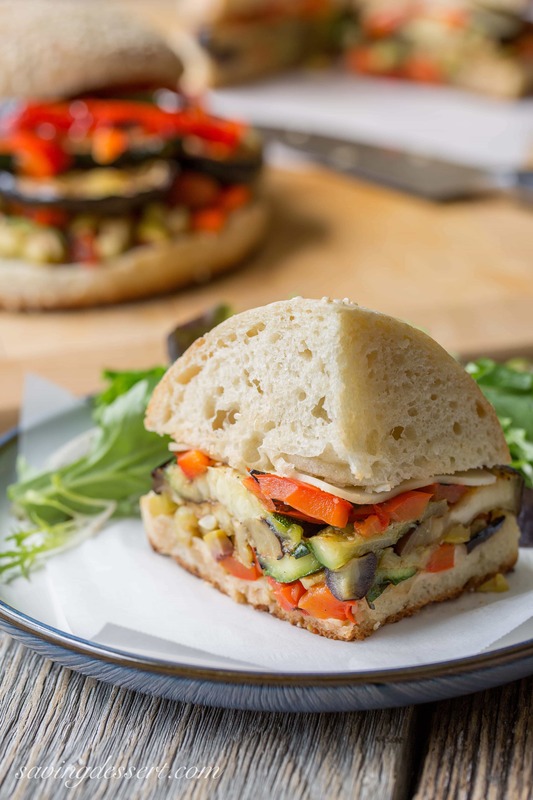 : ) And to turn the traditional meat-laden sandwich into a vegetable one is a wonderful idea! I am totally behind it. Looks delicious and so hearty yet healthy. Great job, Tricia! Thanks Monica – Hope you have a wonderful 4th! May all your recipes be awesome!!! Now this is a seriously awesome sandwich! Thanks Mandy – hope you have a great weekend! Bread made with starter tastes particularly great, but I love the most is those roasted summer veggies. Simply mouthwatering! 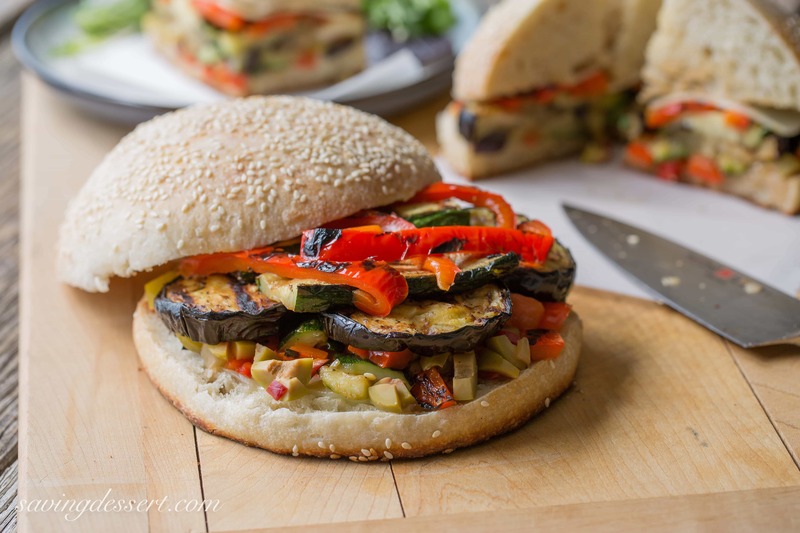 I do love grilled and roasted vegetables – and adore making bread so this was a win-win! Hope you have a great weekend Angie! Lucky you Pam! I’ve always wanted to go to New Orleans – just haven’t gotten there yet. I love knowing the background of food! This looks so delicious with the lofty buns, cheese, grilled vegies….What a treat! Thanks Toni – it was even good left over. Yum! Happy 4th of July!! I hope you and your family have a wonderful weekend! Kids just don’t know how lucky they are to be able to eat anything and burn it off in no time – everything slows down when you get older … except time! Now that is a sandwich Tricia and it looks wonderful too. Happy Fourth to you and your family. Thanks Cheri – happy 4th to you! These are fabulous sandwiches! Love grilled vegetables 🙂 Those buns look great as well. Have a great 4th. Who needs meat? These look full of flavor and fantastically delicious! They are very tasty Chris – I do love the meat version but this is great too. The olive salad gives it the right touch! Have a very happy 4th! Yikes that’s an awesome sandwich! I love that you did a veggie version, and that bread is incredible. Could you use that as hamburger buns, too? Or would it be too dense?